I always check the tie rack of any thrift store because there will inevitably be a gem lurking among the horrid polyester designs. 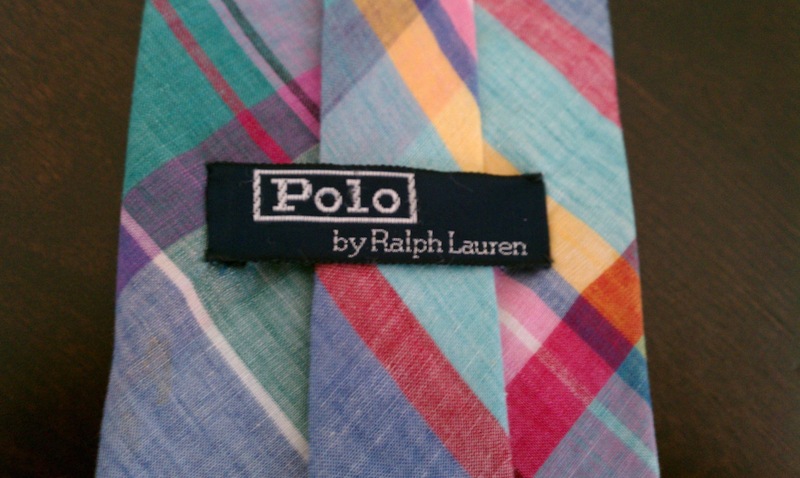 Yesterday, I found a perfectly good 100% cotton madras plaid tie by Ralph Lauren. It was priced at $6.99. 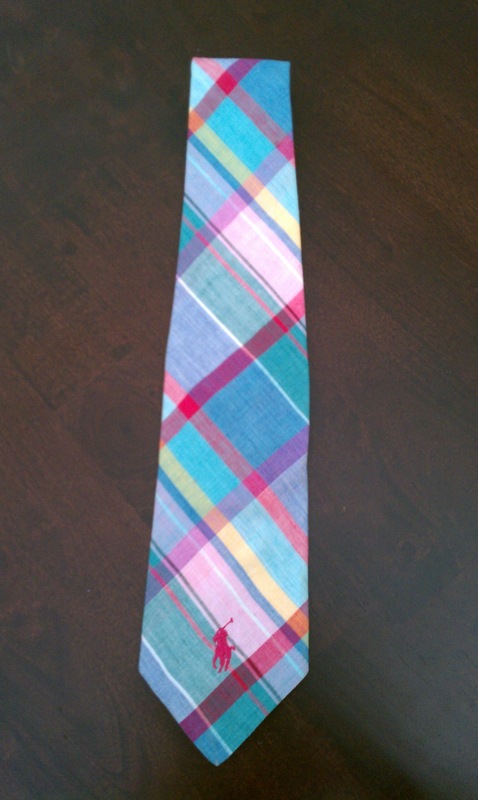 One man’s last season tie, is another man’s treasure. But I’m not sure whether I will actually wear this one. I really don’t like logos on my ties – just a personal preference – so it may go up on eBay. In one store, I found a slew of fine 100% silk Brooks Brothers rep ties for .99 cents each. There was no sign of wear on any of the ties – you always have to check the section of a tie where it is knotted (where friction occurs) to see if the material is worn. You should also check the tip of the tie, where it is pulled through the knot, for signs of wear. I wanted to compare the price of my thrifted tie vs. the Ralph Lauren retail price. 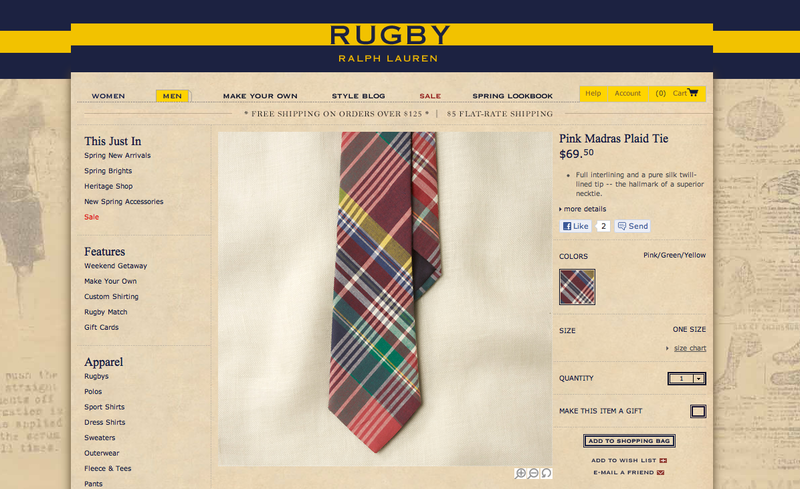 There were no madras ties on the main website, but I did find an example on Lauren’s Rugby site. The asking price was $69.50. So my savings through trifting = $62.51. Ties are usually priced low in thrift stores, and the asking price vs. retail creates a huge savings opportunity. For a total of $17.97, I recently thrifted a navy/cyan grosgrain ribbon belt ($4.99), an all cotton J. 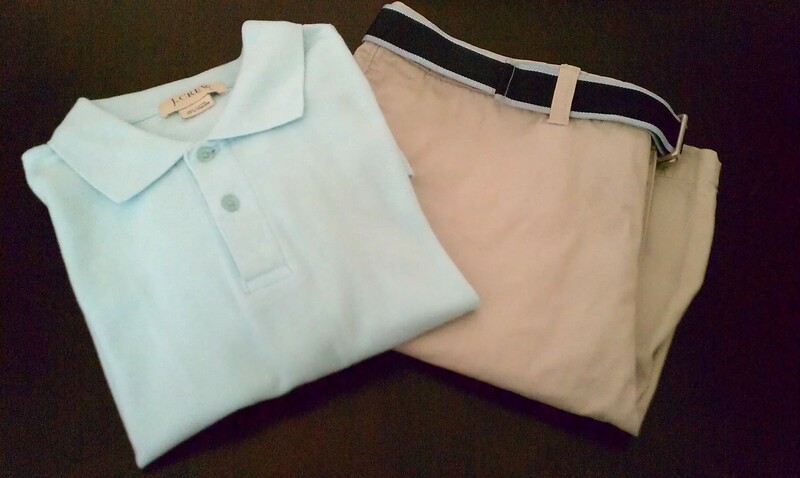 Crew polo shirt of matching cyan with 2-button placket, cap sleeves and ribbed edging ($7.99) and a pair of plain front Bermuda length 100% cotton khaki shorts from Merona ($5.99). 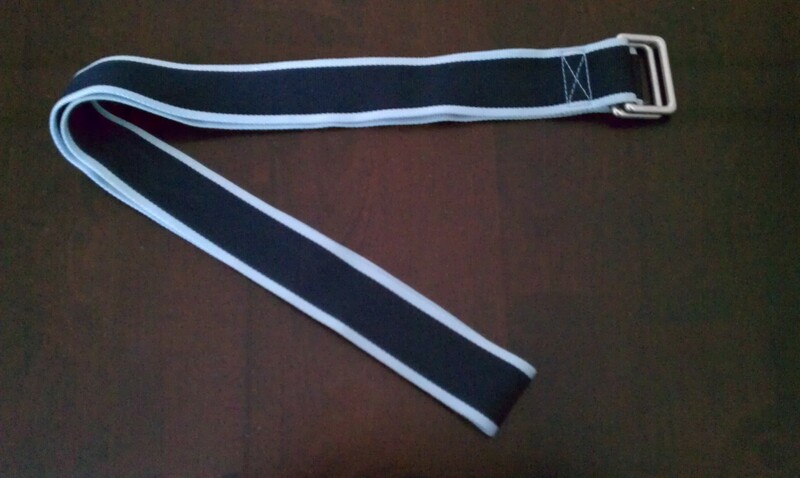 The ribbon belt has no label, but it looks very similar to one made by Vineyard Vines. The cyan color in the detail shots of the belt looks different from the color of the shirt, but to the eye, it’s an exact match. Unfortunately, the lighting changed slightly between shots. All of these items are in excellent condition. The belt seems well-made and durable, and the quality of the J. Crew polo and Merona khakis is surprisingly good. You need not have particular brand names or “status symbol clothes” (i.e. with a crocodile or oversized polo player and horse stitched to your shirt) to look preppy. If you are discerning, you can get away with no name items of classic design and natural fibers, and you will be practicing two key prep traits – thrift and discretion! Preppy is not about being flashy, unless you count the occasional go-to-hell item. But that’s really another discussion. A word about shorts: I always buy plain front. In my opinion, pleats are fundamentally wrong (this applies to long pants as well). I avoid cargo shorts. Although many people like them, I think they have a very unflattering silhouette. They seem to be most often combined with legible t-shirts, fanny packs and flip flops. Enough said. I regard their popularity as a sure sign of cultural decline. 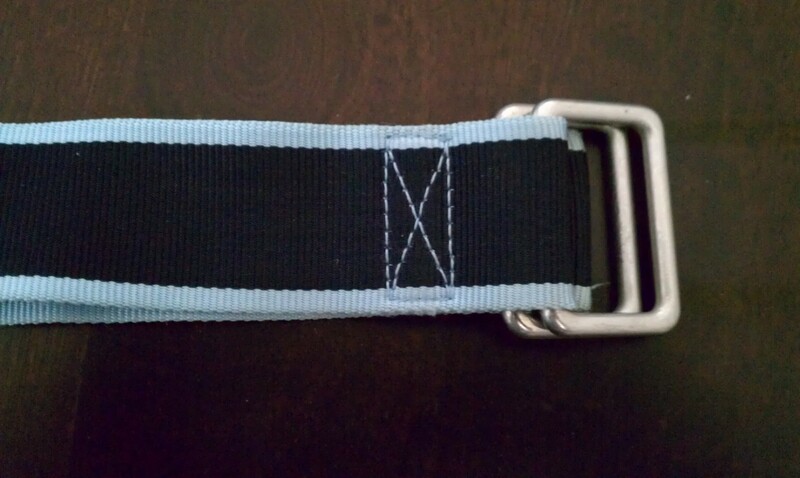 Detail of navy/cyan grosgrain ribbon belt. FORGET WHAT YOU THINK YOU KNOW ABOUT WHALE BELTS AND POPPED COLLARS. WHY NOW MORE THAN EVER NEW ENGLAND’S SINGULAR SARTORIAL AESTHETIC IS THE STYLE FOR OUR TIMES. LET YOUR MIND’S EYE WANDER FOR A MOMENT. Let it come to rest on the prep, that venerable fashion icon who favors ribbon belts and bow ties; that Bostonian done up in tweed or seersucker. Doubtless you can envision this character, perhaps in his natural habitat on Beacon Hill, perched, perchance, at the bar at 75 Chestnut, in a striped button-down or a polo shirt with the collar casually popped. Maybe, in your mind’s eye, you see him greet a fellow prep with the ritual handshake of an ancient secret society, see them reminisce over ancient squash games partaken, no doubt, on the grounds of some ancient summer home. 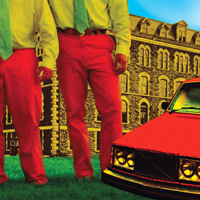 The prep’s pastel clothing, his Clinton-era Saab, his disdain for socks—it’s all so easy to mock. our economy continues to sputter and we grasp desperately for what’s familiar and comfortable, maybe the prep had it right all along. THE ORIGINS OF THE DISTINCT aesthetic we call “prep” might be summarized thus: For generations, well-off denizens of the Northeast passed family money down through long-held investments, padding it with lucrative careers in lawyering, doctoring, and investment banker-ing. When members of this prosperous caste married and bore children, they sent their young to the same preparatory schools they themselves had attended. These schools had dress codes, and said codes involved, for boys, a uniform of coat, tie, and khakis. To distinguish yourself, you wore your clothes decidedly broken-in, the faded fabric of your trousers or blazer suggesting you were wizened and all-knowing. Alternatively, if you were sufficiently brazen, you made yourself noticeable by donning colors that seem out of place in normal life: pinks or purples or bright greens. These made you “fun” and “crazy” and “interesting,” without your actually having to be any of those things. After graduation, the young prep would take his well-honed sartorial sensibility to college, where he was given alcohol and, by senior year, an in for a job in Boston (on occasion he and his brethren would wash up in Connecticut or the WASPier regions of Long Island, too). He’d go on to marry and sire a brood of preppy kids. That was just how such things went. By the time of the Reagan administration, Lacoste polos had become a mainstream look. The hoi polloi had decided they wanted inside the prep bubble. In 1980, The Preppy Handbook, a slender, whimsical field guide, spent 38 weeks atop the New York Times bestseller list. By the middle of that decade, the style had permeated throughout popular culture, finding a standard-bearer in Alex P. Keaton, with his sport coat and penchant for supply-side economics. Noteworthy here is that Michael J. Fox’s Family Ties character and his real-world counterparts began to blend the old austere prep aesthetic with the shameless materialism of the greed-is-good era. Prep became synonymous with the more easily loathed yuppie (a curious convergence, considering the frugality underpinning genuine Brahmin culture). When the yuppie golden era ended with the recession of the early 1990s and pop culture lurched toward an emphatically un-prep moment of flannel shirts and unwashed hair, prep did not die; it was once again merely tweaked. Brands like Polo stepped in and further democratized the look—spreading it to shopping malls near and wide, to be purchased by grunge agnostics—while at the same time reemphasizing and recasting its elitist undertones. The iteration of prep envisioned by Ralph Lauren catalogs whisked you away to the stables of English manors, a place adorned with riding crops braided of the finest Italian leather—but also one where horse-emblazoned shirts and reasonably priced chinos could nonetheless be had for a non-aristocratic sum.